If you really must, it might be best to read Pizza Hut and eat The Sun. Same old boring newspaper comments. 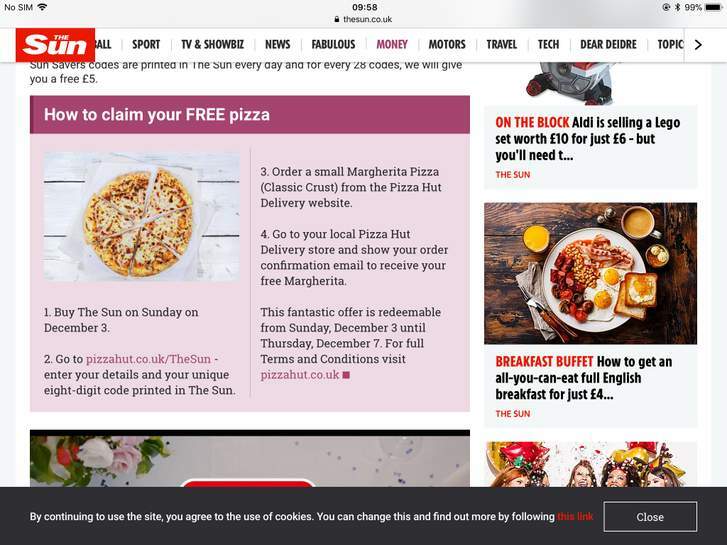 I was going to order one with a random code but decided not to in case a member of staff recognised me and thought I was a Sun reader, for a free Pizza it's just not worth the risk of embarrassment. Also how many codes can 1 person use? Is this eat in or take away? Uhmmmm, a "SMALL classic crust margherita" costs £10.99 then does it?!!! Glad I only ever have the buffet then!!! That's gonna deny a Sun reader a pizza....hahahahahaha!!! Are they unique codes or generic? Take it that the offer is for collection only from delivery stores? My pizza hut ain't on the list so assume I can't get a free pizza even if I did by the Sun? Surely this is a loss leader for the sun? By buying the paper, having your pizza and not buying again you are doing more damage to then than not buying at all. But it's only a small Margherita pizza. The pizza at my local branch is £9.79 and I'm sure that some people who usually can't afford to buy a pizza from Pizza Hut would be grateful for this offer. The offer is valid from Sunday, December 3 until Thursday, December 7. Surely this is a loss leader for the sun? By buying the paper, having your …Surely this is a loss leader for the sun? By buying the paper, having your pizza and not buying again you are doing more damage to then than not buying at all. Which pizza can you order and what size isit? This^ any random 8 digit code seems to work. nope , not to place an order you don't You do plan on picking this up though , right ? Despise the Sun and their ilk. Does anyone who's got the paper know whether you have to bring the code with you to collect the pizza? Off-topic comments removed. Please remember that soap-boxing is not permitted. Does anyone who's got the paper know whether you have to bring the code …Does anyone who's got the paper know whether you have to bring the code with you to collect the pizza? That's tea sorted for my 6 year old lad, who loves plain cheese pizzas. Entered a random 8 numbers for the code, which were accepted. Don't buy The S*n. Just go to your local and copy the code down. Yes sperately, just order and then click on the link again at the top of this* page. I used the same name and email adress, I did have a look at the terms and conditions and couldn't see anything a bout 1 per customer. It's worth a try anyway as the pizza hut is a 5 minute walk from me. 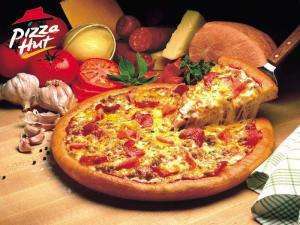 Is anyone else finding that their local store isn't on the list, even though it's a Pizza Hut Delivery store? Wow! the Sun costs £1.10 nowadays according to this posts price, the last time I bought it about 28 years ago it was only about 12p and even then it was as factual as the Daily sport. I tried entering multiple random codes and none work. Any help? I presume they pay pizza hut for this promo, don't see what pizza hut gains much otherwise?